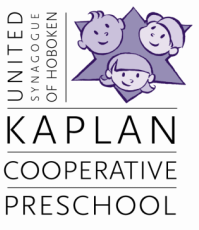 The Kaplan Cooperative Preschool is a Jewish school open to children of all religions who are 2 ½ to 5 years old. The Kaplan Cooperative Preschool strives to help each child develop a healthy lifelong curiosity about all learning. We focus on each child’s developmental needs and promote a positive, secure and accepting environment, enabling each child to grow with a sense of joy and wonderment. Children are encouraged to explore at their own pace in our nurturing, stress-free, stimulating classrooms. Classrooms are designed with a variety of learning centers, each with a hierarchy of materials. These areas include fine and gross motor, language, math, science, imaginative play, and creative arts. Our school is a parent cooperative. Parent participation is an essential component of your preschool experience. Our participatory environment encourages the development of a strong sense of community. Parents are required to help with committee participation and invited as a classroom volunteer once a month (helping parent). School is in session from 8:00 am-6:00 pm from September to June. Children attend on a full-time or part-time basis based on what is right for them - class is offered in morning or afternoon sessions, or full day. Summer Camp starts shortly after school is over and is in session through the beginning of August. Monday - Friday from 8:00-9:00 am. Aftercare: Monday through Friday* 3:00-6:00pm. * When the Jewish Shabbat begins before 6pm, Friday aftercare will remain open but function according to USH guidelines for Shabbat practice. *all students can add early drop-off starting at 8am or stay for enrichment and/or aftercare until 6pm.